The story behind Jack "Boomer" Morrison's nickname, which was inspired by NBC network executives. Clancy (Helen Hunt) meets Boomer (David Morse). 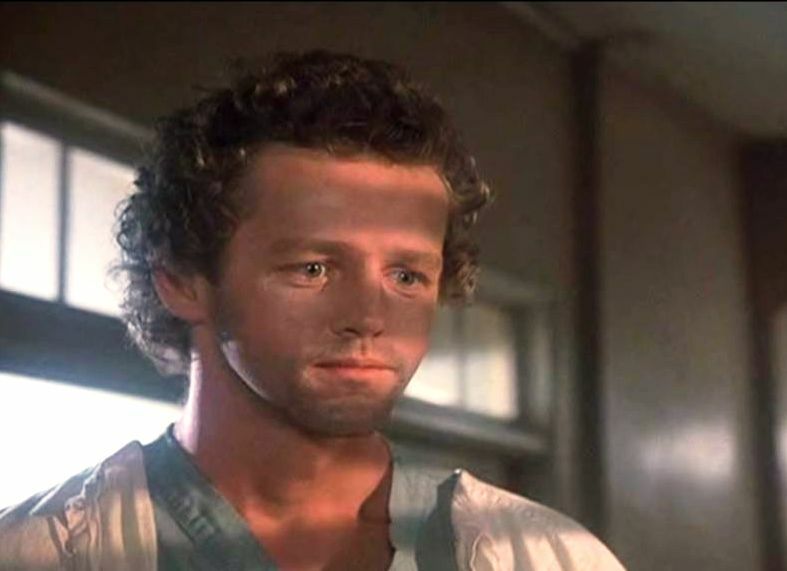 In "Hello, Goodbye", the finale of season two, recently-widowed Dr. Jack Morrison (David Morse), having just barely managed to qualify for the second year of the residency program at St. Eligius, spends a day on the town with his son, Pete. 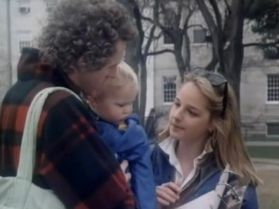 While out and about, he meets a pretty and charming college student named Clancy Williams (Helen Hunt), who is gathering signatures on a petition for nuclear disarmament. Jack asks, "What is this? ", and Clancy replies, "What does it look like, Boomer? It's a petition." They begin a relationship that carries into season three, with a brief re-connection in season four. When Clancy meets the other doctors, she refers to Jack by her pet name for him, "Boomer". The staff picks up on it, and Jack gets referred to as Boomer on and off throughout the rest of the series. In season three's "My Aim is True", repeat patient Mrs. Hufnagel (Florence Halop) introduces herself to a candidate for the position of Dr. Auschlander's assistant, and gives her the lowdown on what really goes on at St. Eligius. "Sodom and Gomorrah. You name it, the doctors at St. Eligius do it. That bleach-blond, Ehrlich, he used to get his jollies by tying up his ex-wife. There's no shame around here. They've even got a doctor here named 'Boomer'." The implication is that Clancy gave him the nickname because of his prowess in the sack. However, we've seen that she started calling him that before they knew each other in the biblical sense. Tinker: You end up calling him "Dr. Nice Eyes". The network had a real penchant for his character, and they also had a series on the air at the time called Here's Boomer about this little dog, and they would liken their need for the Morrison character to how much they liked the Boomer, you know, they always wanted to get more of the dog in there. So it basically boiled down to, for our purposes, "more Boomer," which is why we nicknamed him "Boomer". I don't know if I told that story exactly right, but that's pretty much the distillation. Roberts: I did a Boomer show. Roberts: And it was hysterical, 'cause the dog got the close-ups first. In season five's "Nothing Up My Sleeve", the origins of Boomer are mentioned in the show. Jack has recently returned to work after his traumatic sexual assault while doing community service at a prison, and his mind isn't on his work. Drs. Chandler, Wade and Ehrlich (Denzel Washington, Sagan Lewis, Ed Begley, Jr.) are eating in the cafeteria when Dr. Griffin (Bruce Greenwood) approaches. Chandler: He's spacy, self-doubting...he's inefficient. Griffin: Who are we talking about? Griffin: Why do you call him "Boomer"? Chandler: I don't remember. Something to do about a dog? So that's where "Boomer" comes from. Those who know David Morse from his later roles, like detective Michael Tritter on House or the neighbor in Disturbia, might be surprised that he played the sensitive, caring, puppy-dog of a doctor in the role that brought him to prominence. Here's some Boomer, courtesy of YouTube. 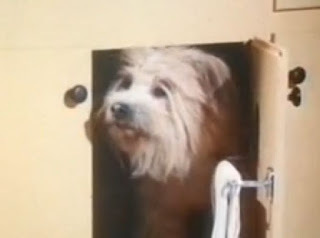 The show was about a highly intelligent dog who roamed from town to town helping people with their problems, similar to Lassie, or more closely, Benji. The premise may sound awfully familiar to a Canadian like me, who grew up watching reruns of the most recent incarnation of The Littlest Hobo, which premiered on CTV in 1979. 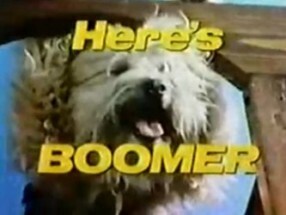 The opening theme of Here's Boomer, which ran on NBC from 1980 to 1982. A fan posted an entire episode of Here's Boomer in three parts, recorded off German TV. Enjoy "Boomer and the Bucketeers", featuring guest star Meadowlark Lemon. heresboomer.com, a "fan site for that shaggy little Dog from TV", and its older version with more content. A title and air dates guide, from epguides.com. A blog post about the show from Talking Moviezzz. The website of a man who tried to legally change his name to "Boomer the Dog". For real. Hello. At your earliest convenience, please contact me. I sent a message to what I believe is your Facebook fan page for your music. My blogger profile contains my email address or you can message me on Facebook if that is indeed you. Nice site, by the way. Thanks for your interest! You've inspired me to add a contact page.